Self-explanatory Extreme Ice by Mt Baker Vapor is a super cool minty vape. Think of it as the cooler version of any mint or regular menthol vape juice flavors. A smooth, strong and super fresh vape that is a must for the mint or menthol fan. Ice ice baby. Very cool Flavor great for cutting other liquids. Very refreshing. Leaves a great aftertaste. I will definitely buy again! Great to mix other flavors with. Very ice menthol flavor and good price! Delicious and high quality at a low price. LOVE this liquid! Exactly the flavor I’ve been looking for. It is very hard to find a good menthol ejuice. But this Extreme Ice is perfect! Nice smooth menthol. Best I have found in as many years as I have been vaping! Great price too! If you love sucking on Hall’s cough drops, you will enjoy this menthol mint juice. It’s not as extreme as the name says, however it is very refreshing. Really clean and cool taste. A little strong for me so I mixed it with some fruit eliquid. I used to ONLY vape Halo Sub-Zero but this is a waaay better price and for a fraction of the cost. I have made a permanent switch and at The ETs great price of 5 for 30$(hopefully this deal continues;) I will continue to buy well even after that since the price is only 99cents more even during regular pricing. Love it, and no steeping required in my opinion. I used to smoke 2 packs of camel menthols a day and this is the best juice for my extreme menthol love that I can love the price of too! The Mt Baker Extreme Ice Flavor is definitely extremely ice cold. It's refreshing, and the menthol is so strong that it clears my sinuses. It's the strongest, most icy menthol flavor I've ever tried. The 50/50 PG/VG blend is a bit harsh and would probably be smoother with higher VG. I recommend choosing the lower 3mg option so that it's not as harsh. My biggest problem with this flavor is that this is not a peppermint flavor at all. This is actually spearmint, which I don't like as much as peppermint, so I'm going to keep searching for a good peppermint-based menthol flavor instead. Strong mint/menthol taste, has a bite to it. Excellent when cut with 10% of something fruity to 90% of this flavor. This is the one I always order cause I like to mix it with other flavors and works perfectly. Menthol ice with no after tast . 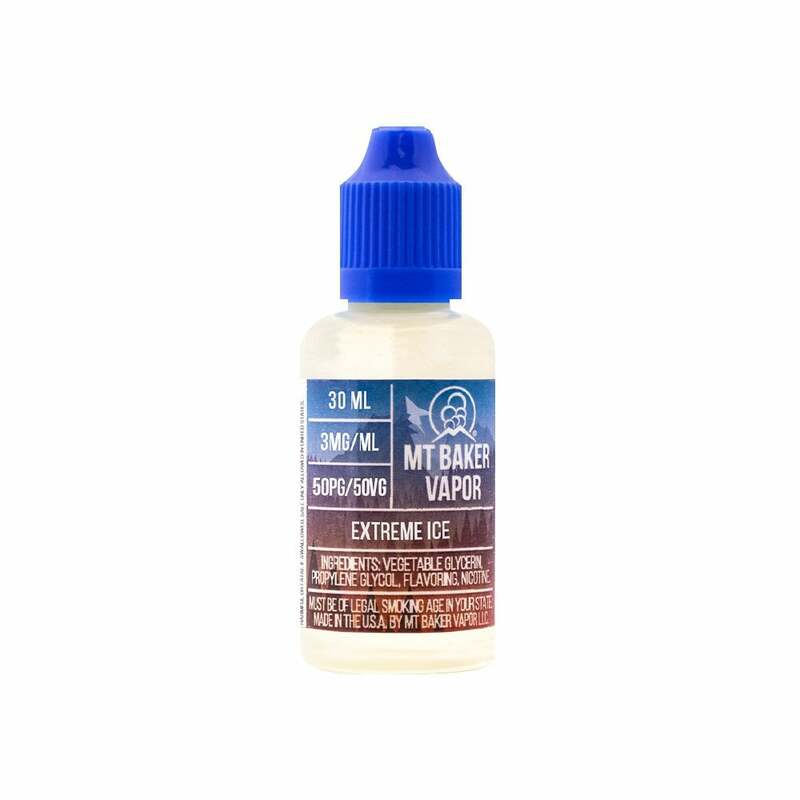 The extreme ice is the best menthol type flavor without any after taste. ET is very good for customer service, shipping, etc. shipping is very fast and good please keep this product in stock it is hard to find and your price is very good. I will be ordering this product from you now and not the vape shop I usually go to thank you for your service. The BF loves mixing this w/ other flavors!! Loves the taste!